The earthquake and the subsequent Tsunami which followed recently in Japan has also affected the automobile industry big time. Most of the car manufacturers in India are of Japanese origin and had to source components from there. Notable amongst them is Toyota Motors Corporation, world’s number 1 car maker and the largest car manufacturer in Japan. Following the earthquake, Toyota have closed production at two of its facilities in Japan. The facilities had an annual production capacity of about 420,000 cars. These cars were mostly for the export markets. 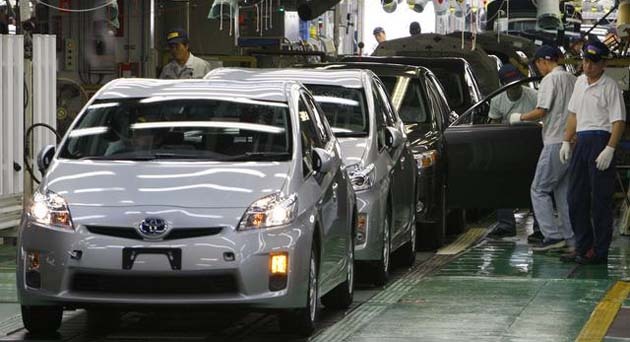 Miyagi and Iwate, the two places most hit by the Tsunami and earthquake had two of Toyota’s facilities and the company has issued an immediate closure of the same. Moreover company workers and personnel have been moved to safer locations. As of now, the condition of the facilities hangs in the air since they aren’t accessible anymore. Honda Motors also had to close about 4 of its facilities and two research and development centers following the earthquake. Nissan Motors Corporation have also halted production and also stopped work at its operation center. 4 of Nissan’s facilities have been hit with this closure and it is also said that at the Tochigi facility, two employees were injured by the after effects of the quake. As far as India is concerned, Toyota would have a hard time procuring its engine components for the Etios sedan and the upcoming Liva hatchback. Earlier on we had reported that Toyota has plans to reduce the dependence from its mother nation and rather open up engine production facilities here in India (https://www.indiandrives.com/new-rs-500-crore-engine-plant-for-toyota-in-india.html). Unfortunately those plans have also been put on the back burner following the devastation caused by the earthquake. Company officials from Tokyo had mentioned that any further action for the Bidadi plant in India would be only taken after the conditions in Toyota’s Japan facility are assessed.